Zebra 220XiIIIPlus - Thermal transfer Industrial Printer (203 dpi, USB, Parallel, and Serial (RS-232) interfaces, 8.5" max print width, 16MB SDRAM, Rewinder, Clear Media Side Door & Media Hanger). Includes power supply. Cables sold separately. See accessories. 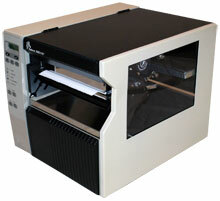 The 220XiIIIPlus quickly prints large labels, up to 8.5 inches (216 mm) wide. The 220XiIIIPlus quickly prints large labels, up to 8.5 inches (216 mm) wide, at 10 ips. With its all metal construction, the 220XiIIIPlus printer is ideal for industrial environment applications where high quality, large labels are needed - chemical drum (HAZMAT) identification labels, pallet/container shipping labels and product identification labels for large rolls of paper or textiles. Capable of printing up to 55 pages per minute, the 220XiIIIPlus is also a high-speed alternative to laser printers for printing 8.5 inch x 11 inch packing slips and invoices for high volume, on-demand order fulfillment applications. The 220XiIIIPlus printer is designed to deliver maximum performance and reliability in the most demanding industrial applications. The 220XiIIIPlus features 16MB RAM, 4MB Flash, & standard parallel, serial, and USB 2.0 interface ports. All units ship with one user's manual. Maximum Label Roll Diameter: 8"
The Zebra 220-701-00200 is also known as ZEB-220XIIII+REW	or 22070100200	.